When was the last time you looked at the ingredients on the biscuits in the supermarket? I told my daughter about the effect that palm oil is having on the planet and now every time we are in the biscuit aisle we go on a hunt for a packet of biscuits that does not contain palm oil – we call it the palm oil challenge. It is really hard to find a packet! Impact on the Environment: Up to 300 football fields of forest are cleared every HOUR to make room for palm oil plantations. 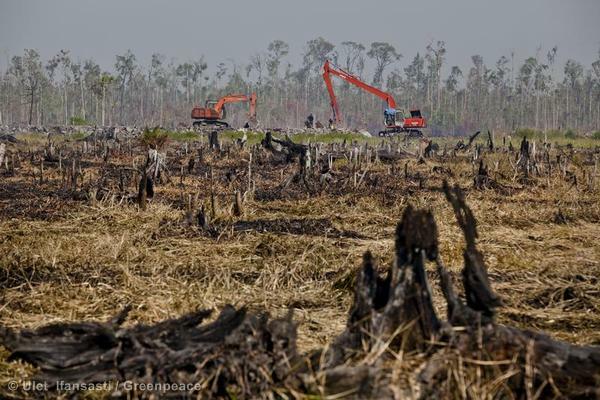 Deforestation for palm oil production also contributes significantly to climate change. The removal of the native forests often involves the burning of invaluable timber and remaining forest undergrowth, emitting immense quantities of smoke into the atmosphere and making Indonesia the third highest greenhouse gas emitter in the world. Impact on Animals: In the past 10 years, the orangutan population has decreased by 50 percent as the result of habitat loss from forest clearing for palm plantations. Other large animals that suffer as a result of this development include species like the Sumatran Tiger, Sumatran Rhinoceros, Sun Bear, Pygmy Elephant, Clouded Leopard and Proboscis Monkey. Road networks that are constructed to allow palm oil plantation workers and equipment access to the forest also increase accessibility of these areas to poachers that are looking for these kinds of valuable animals. This allows poachers to comfortably drive to an area to sit and wait for their target where previously they may have had to trek through inaccessible areas of forest. Impact on People: The Palm Oil industry often has devastating impacts on the people living in these areas. All too often, the government’s main interest in the country’s economy leads them to allow corporations to take the land owned by indigenous peoples for their own financial benefit. The palm oil industry is also linked to major human rights violations, including child labour in remote areas of Indonesia and Malaysia. With plantations systematically destroying the rainforest land that the local people depend on, communities are continuously finding themselves with no choice but to become plantation workers. Faced with poor and degrading working conditions, they often earn barely enough income to survive and support their families. Instead of being able to sustain themselves, indigenous communities become reliant on the success of the palm oil industry for their income and survival, leaving these villagers incredibly vulnerable to the world market price of palm oil which they have no control over. But it says it’s “sustainable”: Sustainable palm oil has been under fire for several years from environmentalists and organisations who feel it is nothing more than a greenwashing scheme. 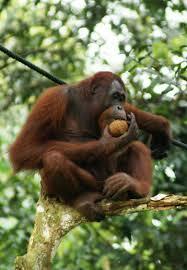 Impact on your body: Palm oil is high in saturated fat so it’s not even good for you. Because avoiding palm oil means not buying any biscuits, and we all love biscuits in this house, I have to make my own. 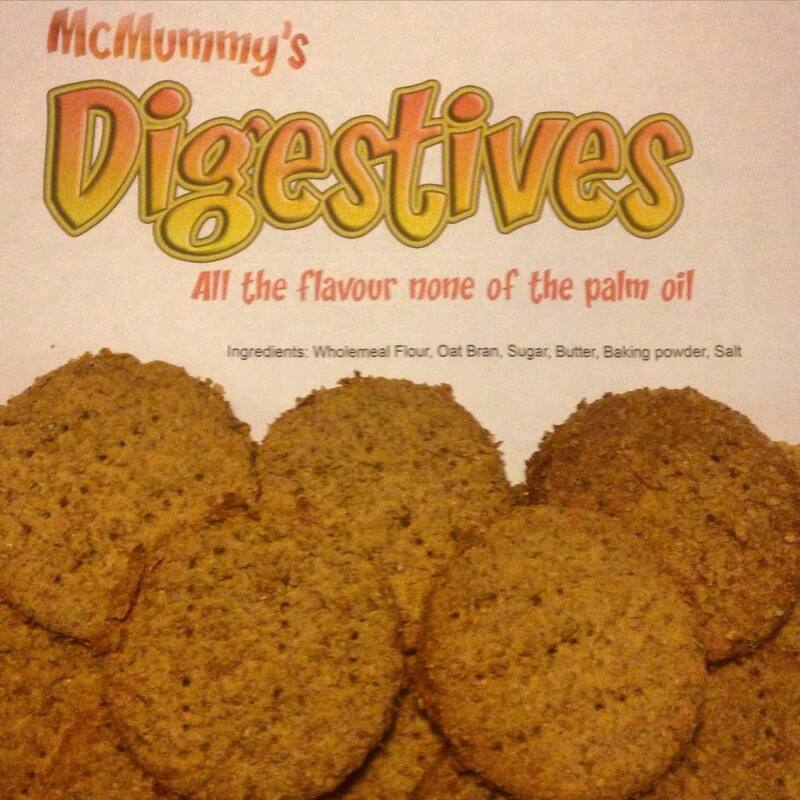 I went through a real trial trying to find the perfect Digestive biscuit recipe I found it so here it is, hope your family enjoys it too. My family insisted that I make packaging too! Put the flour, baking powder, oatmeal and butter in a mixing bowl and rub in with your fingertips. Roll out on board very liberally sprinkled with plain flour as the dough can be quite sticky. When it is about 5mm thick cut into 3 inch rounds. Place on a tray and sprong a pattern in the top with a fork. Bake on a greased tray for 12 – 15 mins. Should you take Turmeric supplements? What are the benefits of Turmeric?